Byzantine, Texas: I did not call the righteous, but sinners, to repentance. I did not call the righteous, but sinners, to repentance. (ACN) - The Orthodox Church in Russia is one of the few institutions trying to help inmates in the country's prison system. ACN has been supporting its work by helping to fund the construction of prison chapels and the provision of religious literature. 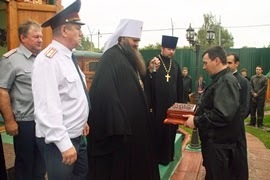 Father Igor, who is responsible for the prison chaplaincy service in Nizhny Novgorod, has personally baptized almost 400 prisoners since 1998. “Very soon I was able to observe many changes in people's souls. Half a year later, there was a group of them who came, as a matter of course, to morning and evening prayer. And on Sundays, when I came to celebrate the Sacred Liturgy, they had already prepared themselves during the week with fasting and prayer, for confession and the reception of Holy Communion." What saddened Father Igor was the fact that many people who actually possessed talents and gifts which they could have used for the good of society had fallen on evil ways and used their gifts and their intelligence for the wrong ends. He believes it is due to the spiritual emptiness in many people's souls. For many of them, their time in prison, with the help of this pastoral support, is a chance to find their way back to the right path. Many of the former inmates whom Father Igor has supported over the years have since served their time and been released. He still keeps in touch with many of them today. He has married them and baptized their children, and many of them continue to come, Sunday after Sunday, to church. And a few of them, who have managed to become successful and build up a new professional life for themselves, now also support the work of the Church financially and have themselves become true benefactors. As Father Igor explains, "In actual fact, many people who have been sent to prison are well disposed towards the Church. In my experience, they think a lot about their sins and about the meaning of life. People whose lives run smoothly often think they don't need God." Surprising though that may sound at first, it is exactly what Jesus tells us in the Gospel: "It is not the healthy who need the physician, but the sick."